Regardless of the size, reach or nature of your business, it’s important to ensure that your property is as visually appealing as it is safe and accessible. And while commercial paving and sealcoating are something all business owners must consider at some point, it’s one of those things that just never seems to come at an opportune time. Employees and guests can’t park where they usually do, operations often have to cease for a period of time, and some pavers leave more of a mess than they started with. At Shamrock Paving in Rochester NY, we’ve become known as a favorite among WNY businesses large and small over the years. Here are just a few reasons to let us put our expertise and professionalism to work for you. Our team of expert commercial paving specialists bring over three decades of professional experience to each job. This allows us to work in a highly efficient manner while further ensuring that not even the slightest element has been overlooked. We work hard to complete projects on time and at budget, while giving you the confidence that your lot or commercial drive will last and perform. In addition to making significant investments in the most advanced commercial paving equipment, we also strive to use chemicals and materials that are safe, effective and environmentally sound. This can help reduce some of the odors that are common to commercial paving, while allowing us to work efficiently to complete your project faster than those with outdated machinery. One of the most dreaded aspects of having a commercial lot paved, is having to close your doors during and immediately after the process. This can be very costly and frustrating, and it’s something we work very hard to avoid. Whenever possible we try to conduct jobs during non-peak hours and overnight, allowing you to keep doing business and avoiding interruption to your daily operations. 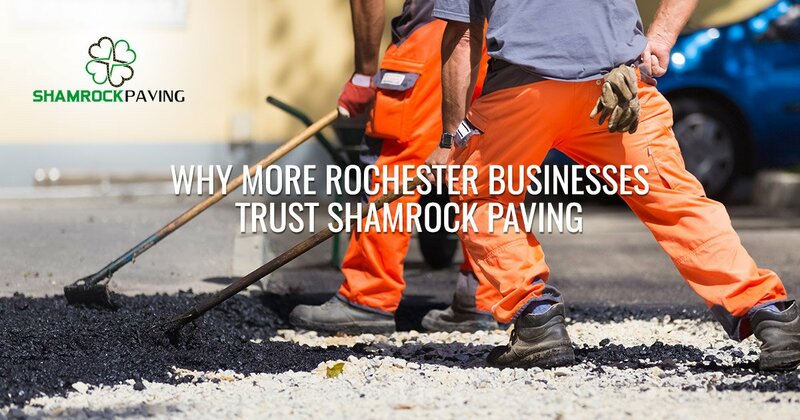 To learn more about why so many businesses and property managers continue to put their trust in the Shamrock Paving team, or to get started on your free paving estimate, give us a call at 585-417-5722 and one of our staff will be happy to help.